Sidmouth is a large friendly church at the heart of this Regency seaside town catering for a mainly retired congregation and for the many visitors on holiday in the town. Special outreach services are held during the year including a quarterly healing ministry. There are a number of midweek activities meeting the devotional and social needs of the membership. 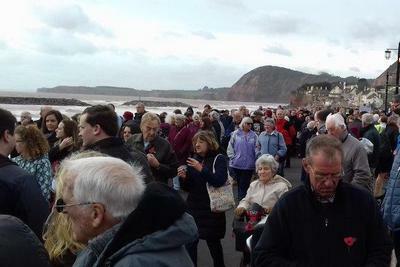 On 9th November 2018, there was a People’s Procession for Remembrance in Sidmouth. All the shops closed. 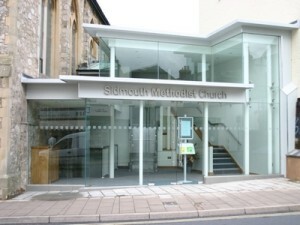 About 2500 people took part, including members of Sidmouth Methodist Church. The procession made its way to the Esplanade where, at 11.00, the last post was sounded for the two-minute silence. Everyone, including the surfers, looked south across the English Channel towards France, to honour those who who fought in the trenches and at sea. 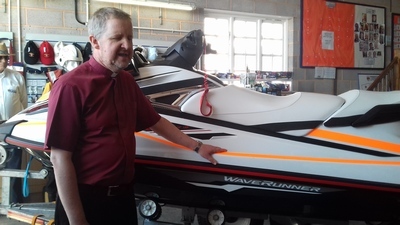 Our minister, Rev Brian Hadfield is chaplain to the (independent) Sidmouth Lifeboat and on Sea Sunday (8th July 2018) was asked to dedicate their new jet ski, named ‘Sid Ski’. 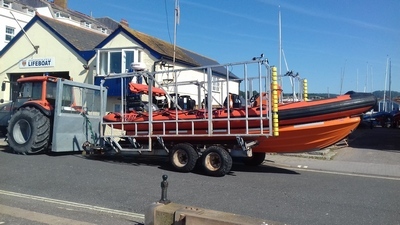 This picture shows the main lifeboat outside the station. It is launched from the beach, after being towed along the esplanade by the tractor.